The Herald will be giving you live updates on the official opening of the First Session of the Eighth Parliament of Zimbabwe. You can follow the proceedings from this blog. 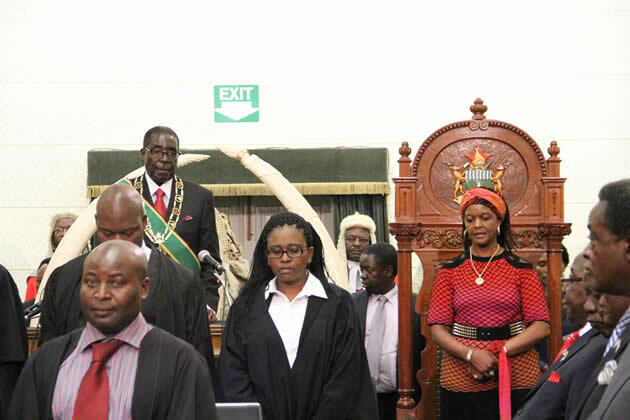 The official opening of the 8th session of parliament of Zimbabwe by President Mugabe sets the stage for the new cabinet to get down to serious business on the backdrop of a strong send-off that clearly spelt the objectives of the Government and how they are to be achieved. President Mugabe concluded by challenging Zimbabweans to continue cherishing their unity and diversity saying that alone was the tonic for a successful turnaround of the economy. 1244: National anthem is recited. Crowds ululate after the singing of the national anthem. 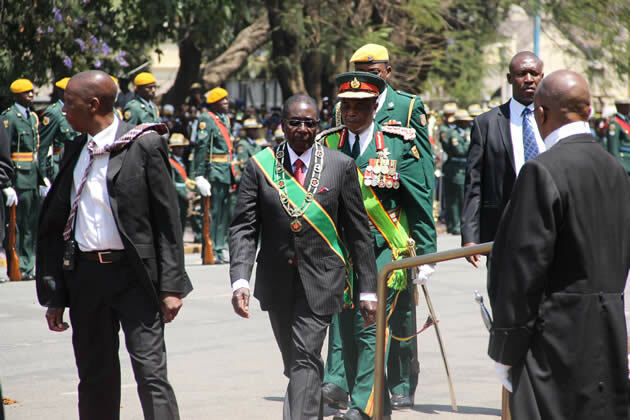 1242: President Mugabe and his entourage leaving the house. 1337: Lauded security forces for being involved in successful peacekeeping missions both regionally and internationally. 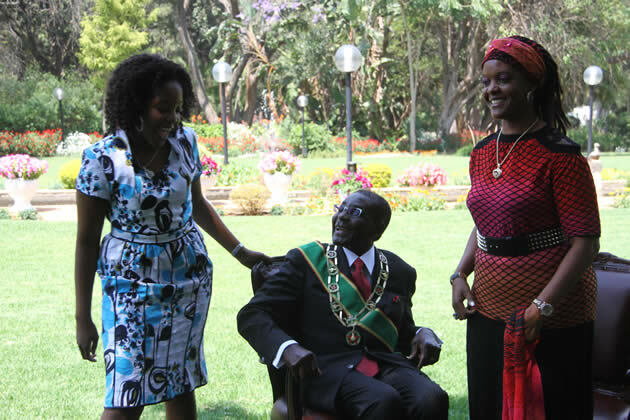 He challenged Zimbabweans to cherish and guard their national sovereignty and to remain united, respecting their cultural diversity. Long live our unity and diversity, he urged. 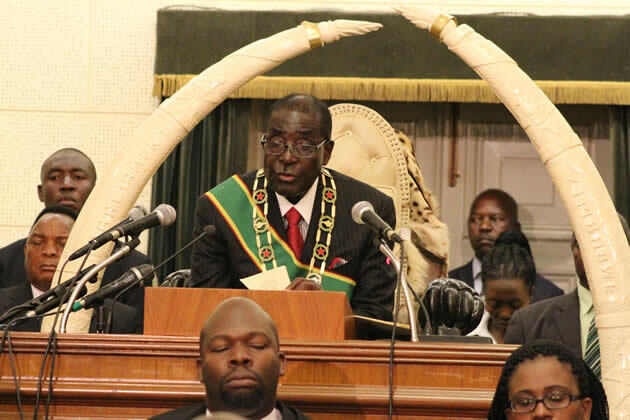 And with those remarks President Mugabe officially declared the First Session of the 8th Parliament of Zimbabwe duly opened. 1233: Mechanisms for proper management of community share ownership trusts to be put in place. 1230: Previous cabinet accused of abuse of Community Development Fund. The new parliament will face the wrath of the law if they abuse the fund. 1226: Castigated bureaucratic red tape. Need to revitalise ailing parastatals that have capacity to contribute 40 percent of the country’s GDP. 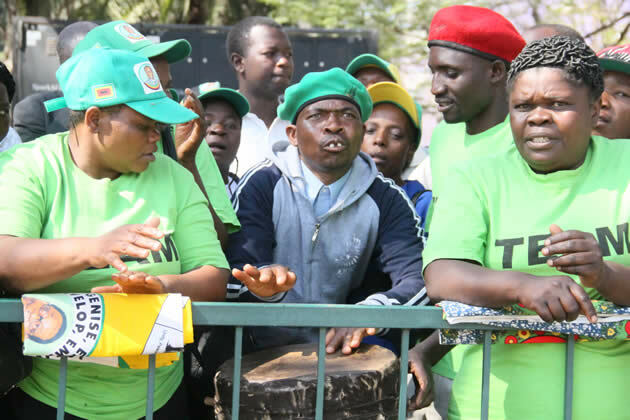 Heads of all parastatals will be forced to adopt key result area assessments. Civil servants receiving poor salaries and working under poor conditions- this must be improved. Government will exercise zero tolerance the scourge of corruption. There will be an anti-corruption commission and members will declare personal assets. 1223: New constitution obligates the state with taking stringent measures on disease control- the Public Health Act to be amended. Government will work on the conditions of employment of health workers. Need to transform the country’s curriculum to meet the ever evolving state of the economy. Need to prioritise youth empowerment. Bills for the Gwanda University and Marondera University of Agriculture will be tabled in parliament for deliberation. 1220: Citizens in some urban centres have endured unreliable water and sanitation services due to lack of capacities in some of the local authorities. A $144m loan from China for the upgrading of Harare’s water supply and infrastructure, the construction of 3 new dams and an additional water treatment plant over 7 years will vastly improve the water situation. 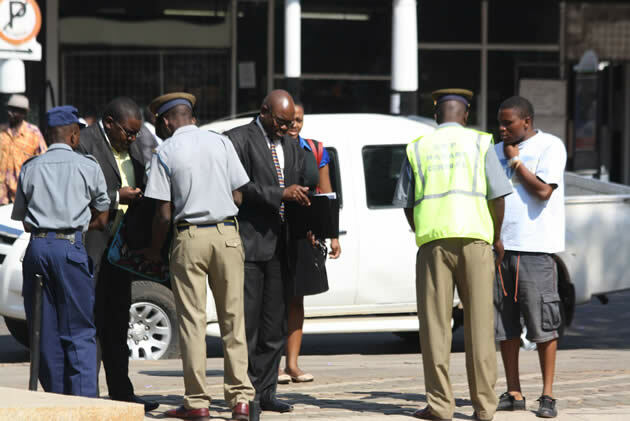 The same will be done in Bulawayo and other cities. 1214: Measures afoot to fully operationalise the Chisumbanje ethanol plant to ensure fuel self sufficiency and create employment as well. Tourism sector’s contribution continues on an upward trajectory- successful hosting of the UNWTO by Zimbabwe and Zambia. Zim should build on the momentum generated by the premier event. Sound transport infrastructure is crucial. Government to continue the upgrading and dualisation of the major highways through partnerships. Air Zimbabwe turnaround bearing fruit and going on well. Plans for the dualisation of the Chirundu-Beitbridge highway at advanced stage. 1212: Power supply significantly improved this year owing to expansion works at power stations. Additional 900 megawatts will be added to the national grid. The solar programme will also be revived. 1210: Government mobilising funds for the resuscitation of closed or distressed companies. Efforts to promote domestic and foreign investment will be pursued- Private -public partnerships will be key. The mining sector to play a catalytic role in the economic revival of the country. 1206: Farmers in drought prone areas to be continually assisted in earnest. there will be debate on the establishment of a land commission. High costs of production stifling the economy. Government prioritising pro-poor economic development initiatives- the revival of key sectors of agriculture, mining, tourism. Amendment to the pension and insurance acts will also be done. 1205: Need to come with new legislation to give legal meaning to some institutions as provided in the new constitution. 1150: MDC members including secretary general Priscilla Misihairabwi are part of the proceedings. There are no MDC-T members present. 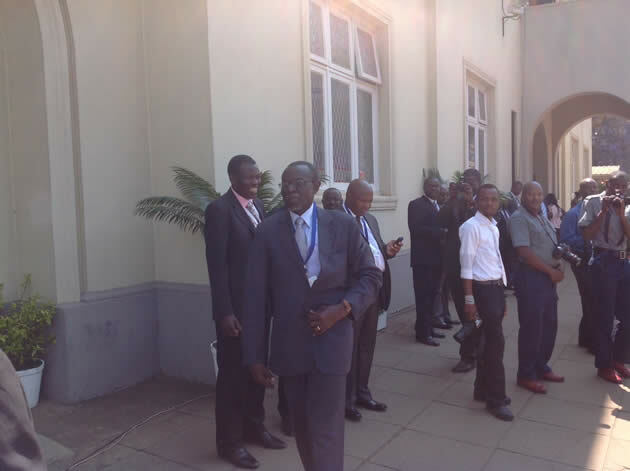 1148: Speaker of Parly, VP Mujuru and Cabinet Ministers enter. 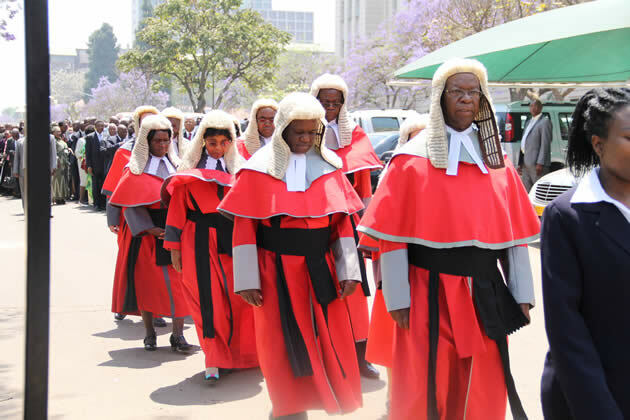 1146: Judges led by Chief Justice Chidyausiku enter the House. 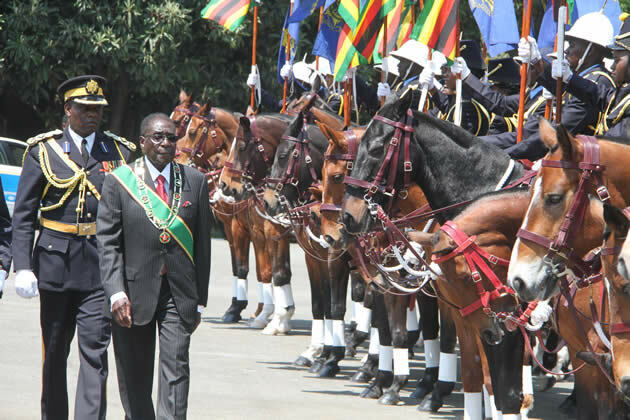 President Mugabe after inspecting the Guard of Honour. 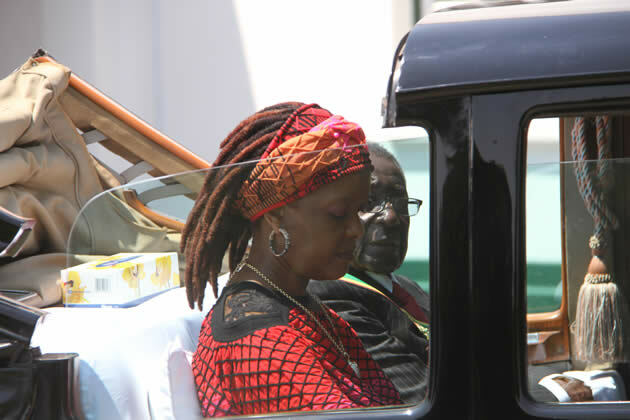 1129: President Mugabe arrives. 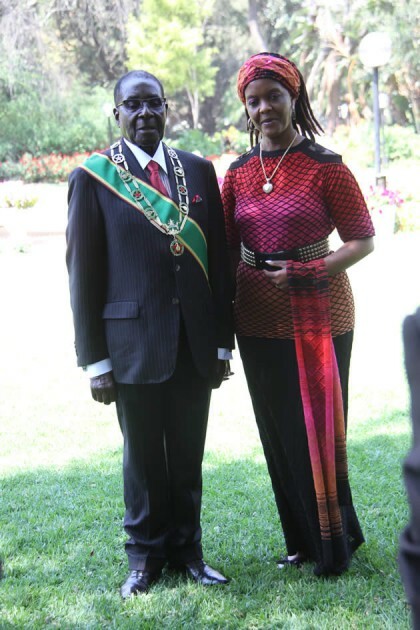 Receives a 21-gun salute simultaneously with a flypast by Airforce of Zimbabwe jets. The anthem is recited. 1117: Security chiefs- Constantine Chiwenga, Perence Shiri, Augustine Chihuri and Paradzai Zimondi have arrived. 1111: Justice Minister Cde Emmerson Mnangagwa arrives. 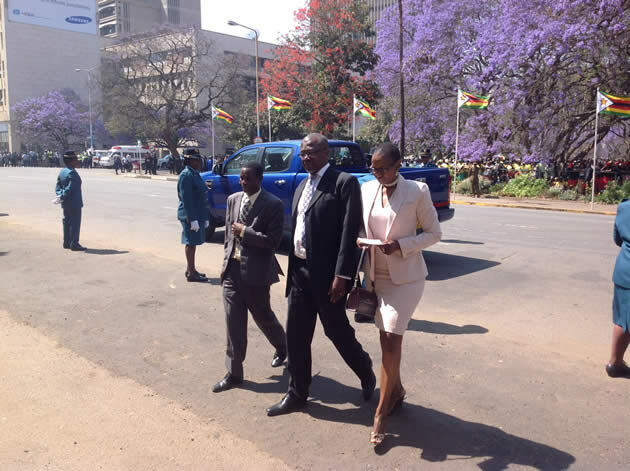 Cde Chris Mutsvangwa and wife Monica have also arrived and so has Health Minister Cde David Parirenyatwa. Some Western diplomats have also arrived. US ambassador, Bruce Wharton arrives too. Dr Parirenyatwa was re-appointed as the new Minister of Health & Child Care. 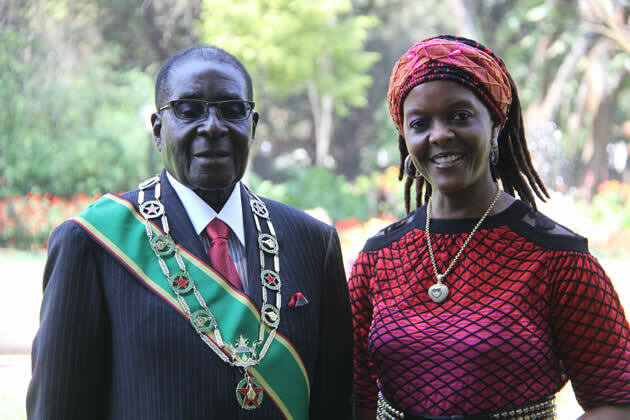 He previously served as Zimbabwe’s Minister of Health & Child Welfare from August 2002 to February of 2009. 1058: Chiefs’ council president Fortune Charumbira has arrived. Mbare MP Cde Tendai Savanhu has also arrived and is receiving a rousing welcome from the crowds. 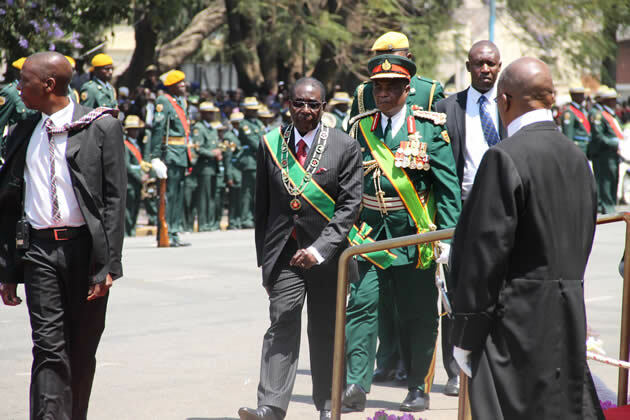 1050: Zimbabwe National Army Presidential Guard of honour takes positions in readiness for the arrival of the President. The Presisdent will inspect a guard of honour. 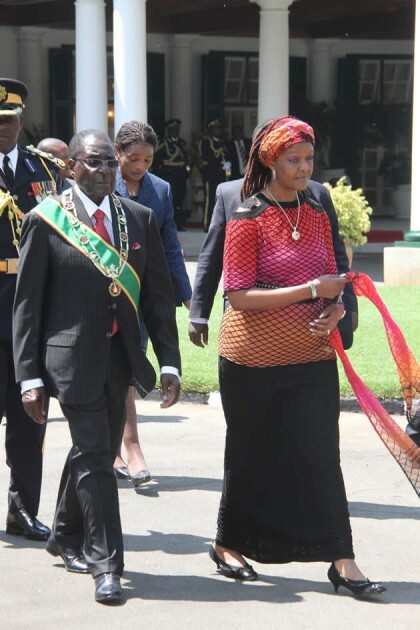 President Mugabe and First Lady Amai Grace Mugabe leave State house for the official opening of Parliament. 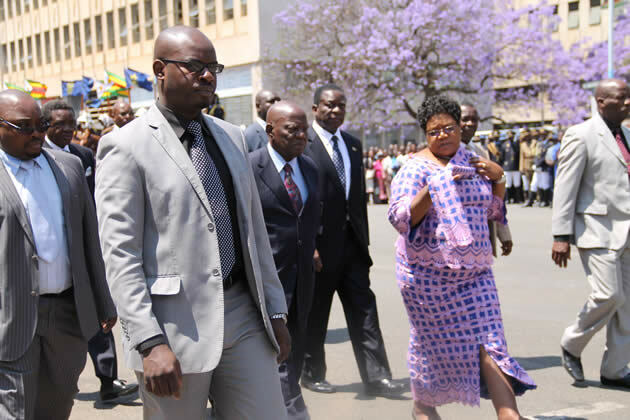 1045: VP Mujuru arrives and so has Minister Francis Nhema. 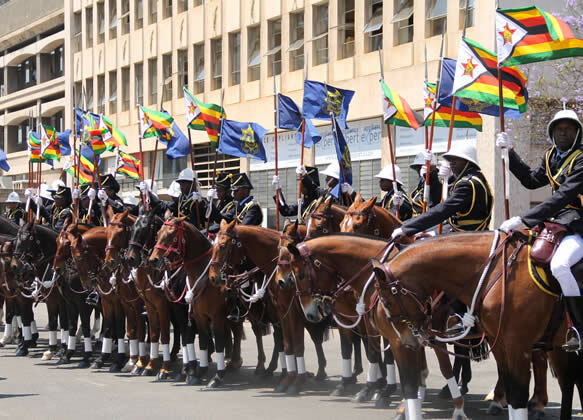 Their arrival coincides with that of the police band with the Zimbabwe National Army carrying the portrait of the President. 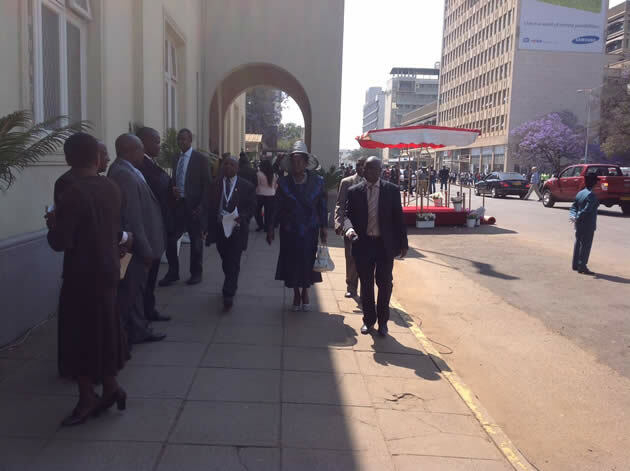 1040: The following Ministers have just arrived- Cdes Didymus Mutasa, Simbarashe Mumbengegwi, Jason Machaya. 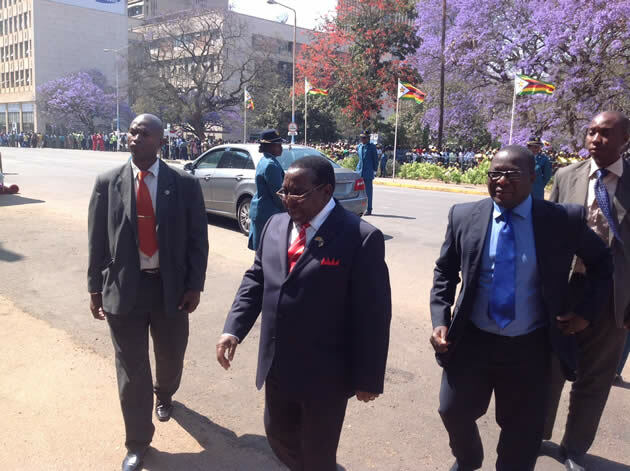 1031: Transport and Infrastructural Development Minister Cde Obert Mpofu arrives. Minister of State for Manicaland Province Cde Christopher Mushohwe has also arrived. 1026: Traditional leaders arrive aboard a Ministry of Public Works bus. Other dignitaries just arrived include Minister of State for Harare Province Cde Miriam Chikukwa. Minister Kasukuwere and wife have also arrived. Ministers Walter Mzembi and Webster Shamu who is accompanied by his wife have also arrived. 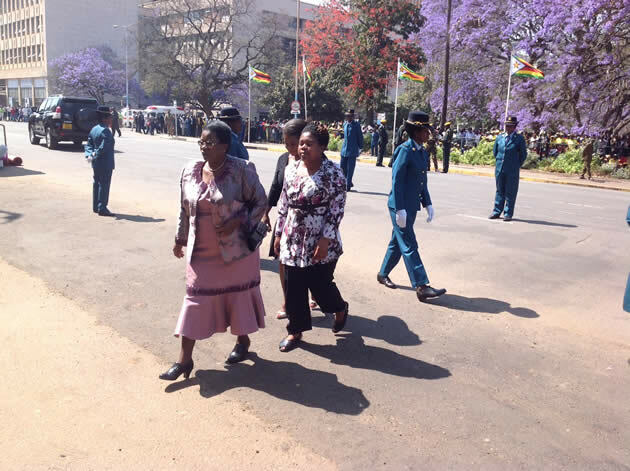 1021: Some of the Deputy Ministers who have just arrived include Cdes Abigail Damasane, Abednico Ncube and Minister of State for Mashonaland West Cde Faber Chidarikire. 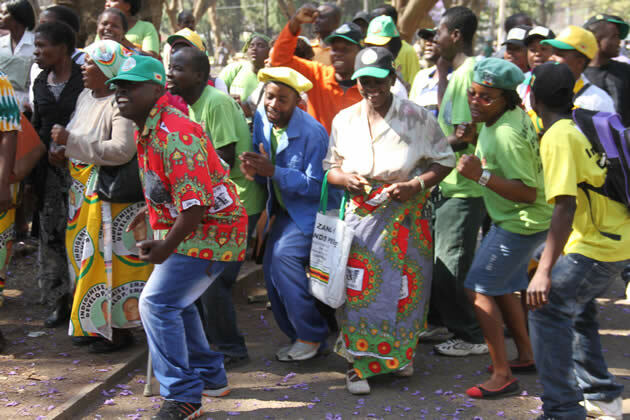 1008: Zanu-PF national chairman Cde Simon Khaya Moyo arrives as Cde Midzi waves his fist (the Zanu-PF symbol) to the crowds. 1000: Women Affairs, Gender and Community Development Minister Cde Oppah Muchinguri and Sports, Arts and Culture Minister Andrew Langa arrive. 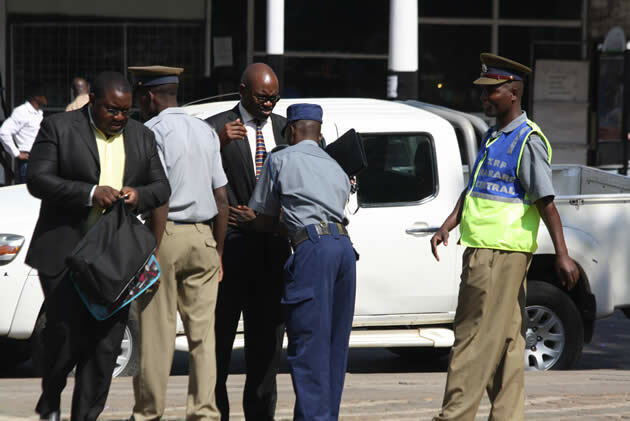 0953: Speaker of the National Assembly Cde Jacob Mudenda arrives. 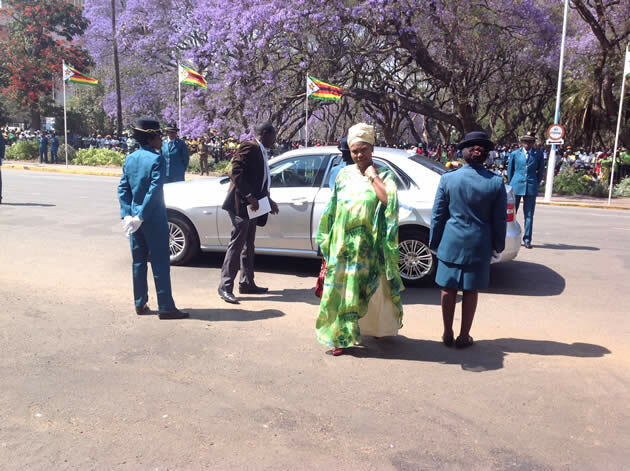 0952: Zanu-PF legislators arriving now. 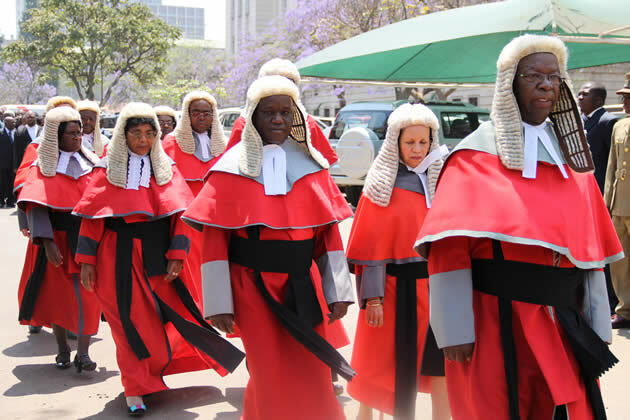 They include Cdes Ambrose Mutinhiri, Charles Tawengwa and Anastancia Ndlovu. 0949: Cde Mudarikwa jokes with journalists saying “pindai muattention muri kutaura naMonster” in apparent reference to his newly assumed status of being Minister from being a backbencher. 0945: Minister of State for Mashonalannd East Province Cde Simba Mudarikwa is one of the dignitaries that have arrived. 0942: Buhera South MP Joseph Chinotimba arrives at Parliament. Entertains the crowd with his usual antics, punches the air and dilly dallies as if he is in a football match. 0926: Police have cordoned off all roads leading to Parliament to allow smooth arrival of dignitaries. 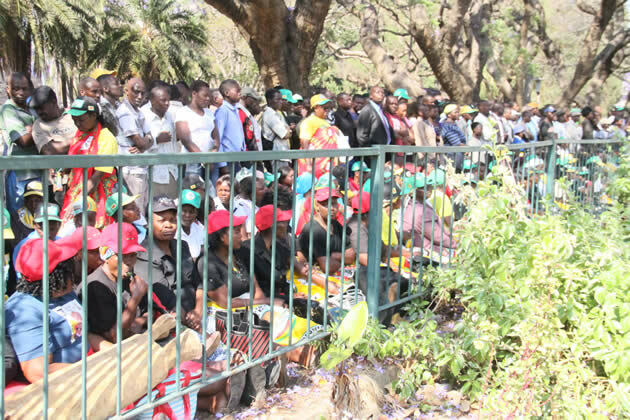 0923: Zanu-PF supporters gathered in Africa Unity Square waiting for the commencement of the official opening of parliament. Dignitaries who include Members of Parliament , their close family members and diplomats accredited to Zimbabwe have started arriving. 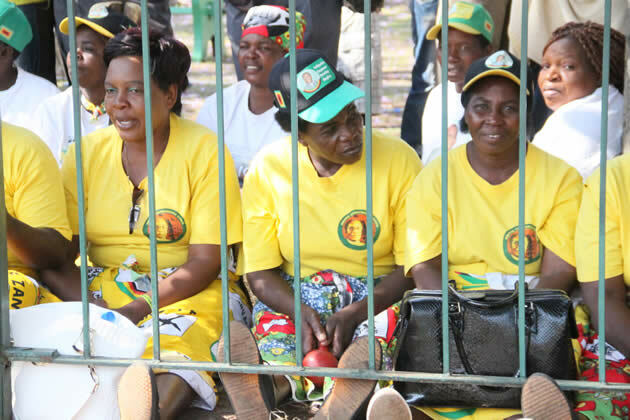 Part of the Zanu PF supporters awaiting the opening of parliament. 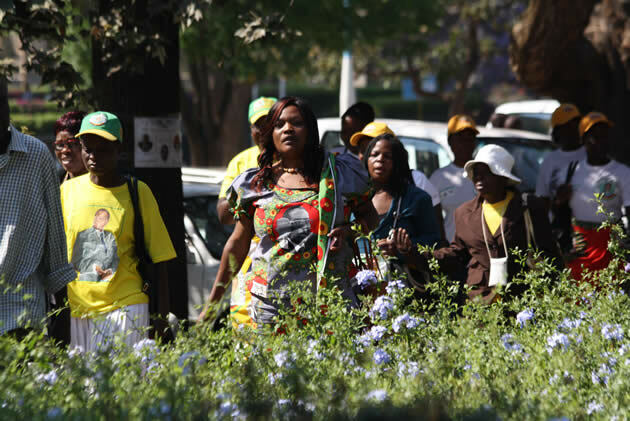 Some Zanu PF supporters arrive for the opening of parliament.